justthefood.com...the blog: Worldwide Vegan Bakesale: OC Represents! This Saturday, April 27, 2013, I will be hosting a vegan bakesale as a part of the Worldwide Vegan Bakesale. 100% of the proceeds will be donated to Barks of Love. Come on out to the beautiful Cleveland National Forest and nosh on some yummy vegan treats, all while giving to a great cause. Wanna help out? Please do! 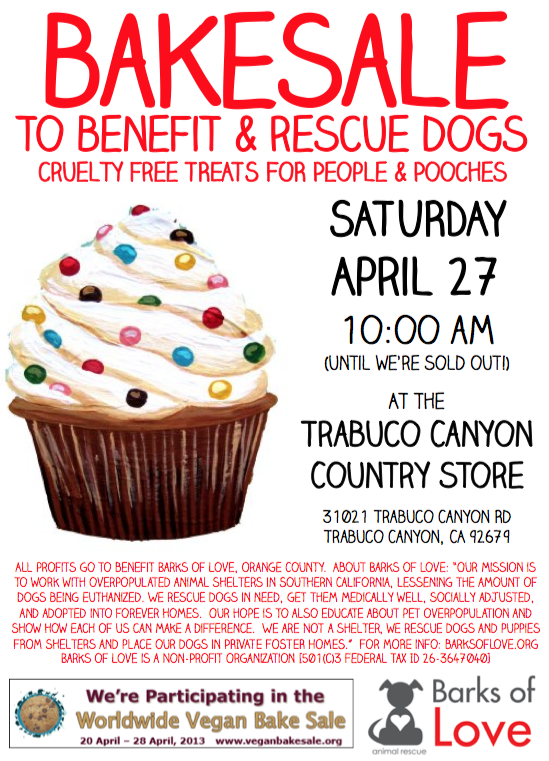 You can come help sell, donate vegan baked goods to sell, or simply spread the word through twitter or anyway you can! I created a facebook event as well, so feel free to share that, too. I'm baking and making like a maniac! I plan on having made 200 cake pops, dozens of cookies, cupcakes, jellies and jams, and rice crispy treats, all by Saturday morning. Pfew! I hope you all make it out to gobble it up. I know I don't want to eat it all. Ha. I'm doing mine on Sunday! It's always so fun. Looking forward to the Cake Pops, now I just have to find this place.